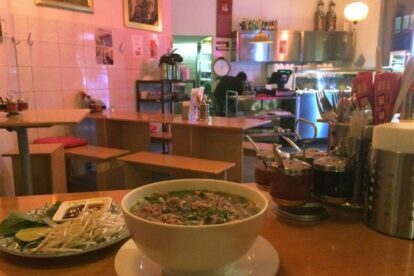 While Vietnam’s cuisine isn’t quite as well-known as its cousins from China, Thailand and Japan, in Zurich Petit Saigon has gone some way towards rectifying this. They serve a wide range of curries and Asian dishes over the counter as well as soups, spring and summer rolls made to order. Most people do take-away but I prefer sitting down at one of their tables. I would like to be able to tell you what the other dishes at Petit Saigon are like, but unfortunately I have never managed to get past their noodle soup! At CHF 20.50, Petit Saigon’s pho ain’t cheap, but it’s a perfectly filling large pot of delicious homemade broth, filled to the brink with beef, chicken or tofu. On a separate plate you get Thai basil, mung bean sprouts and a lime to squeeze into the soup, and you may help yourself to chillies and condiments at your own discretion to suit your palate (and heat tolerance). It’s true that nothing beats getting some steamy, tasty soup in your belly. In my case, as I am completely addicted to Petit Saigon’s pho, I need my fix at least once a week. I don’t know what it is they put in their broth, but it has certainly got me hooked. Don’t tell me you haven’t been warned.